Climate Solutions has a long history of bringing together executives and other business leaders, entrepreneurs and investors who are committed to regional leadership, strong action to reduce global warming pollution and a rapid transition to a clean and energy-efficient economy. Thousands of business leaders from around the region share principles around the need for climate action, advocacy and leadership. By leading the way on climate and clean-energy policy, all businesses in the region will be best prepared to manage risks, seize opportunities and create a broadly shared and sustainable prosperity. Northwest businesses are joining together to support action on climate. Hundreds of businesses in Oregon and Washington are urging policymakers to advance our states' economic and energy security by tackling climate change. 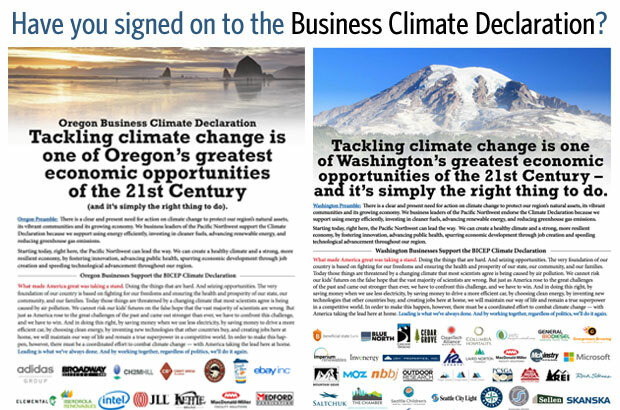 If you are a business leader, please add your voice to the growing chorus by signing on to the Oregon Business Climate Declaration or the Washington Business Climate Declaration today! Thanks to you, the Bright Future looks near!